HERMOSA BEACH, California, USA, March 27, 2019 - When it comes to beach volleyball, it is all about family as the American Olympian Brooke Sweat celebrates her 33rd birthday today preparing for next month’s FIVB Beach Volleyball World Tour event with Kerri Walsh Jennings in Xiamen, China. When asked about the person responsible for getting her started playing beach volleyball, she quickly points to her husband - Nick Sweat. Now, with 62 FIVB World Tour appearances to her credit, Brooke is back traveling internationally with Nick and her parents (Harvey and Rene Youngquist) watching from the sidelines as she and Walsh Jennings attempt to qualify together for the Tokyo 2020 Olympic Games. Nick, mom and dad were in attendance earlier this month in Australia where Brooke and Walsh Jennings captured the bronze medal after losing in semifinals to eventual Sydney Manly Beach winners Niki Laird and Becchara Palmer of Australia in three sets. The Xiamen Open will be Brooke’s fifth event with Walsh Jennings as the American pair has placed 17th, third, ninth and third in their first four FIVB World Tour events together with a 13-6 match mark. Prior to her move to the west coast, Sweat played in her first FIVB event in 2009 before joining the World Tour full-time in 2013 when she and Jennifer Fopma competed in 11 events. Brooke’s season best placement with Fopma was a third at an August stop in Berlin where the pair defeated Kristyna Kolocova/Marketa Slukova for the bronze medal after losing to the Czech Republic team in pool play. Brooke answered questions before practice with Walsh Jennings, the four-time Olympic podium placer and three-time gold medal winner. 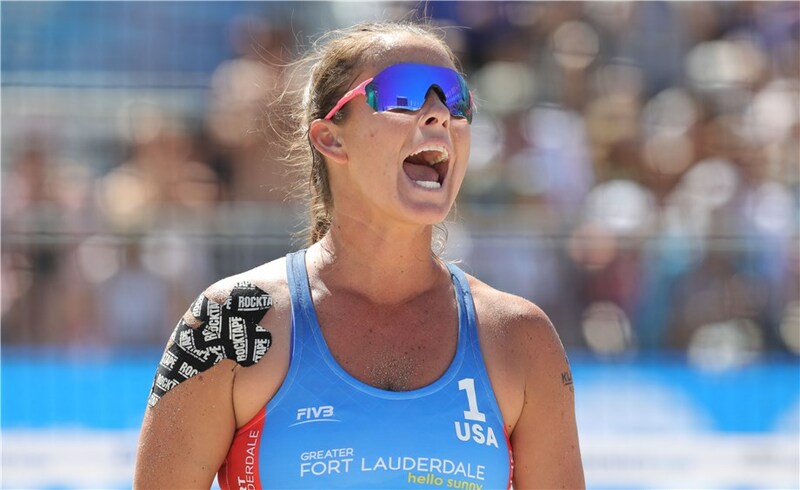 Brooke continues to rehab her right shoulder that limited her play to only four events during the 2017-2018 FIVB World Tour season. Question - What has been your most memorable moment as a beach volleyball player? Question - Is there any one match you remember in your beach volleyball career? If so, who was your partner, who were you playing and why is it memorable? Brooke – “Not a match but a tournament. It was the 2016 AVP Championships in Chicago. Lauren and I had been through so much in the months leading up to this tournament. We had a rough showing at the Olympics in Rio, and both had plans to slow things down after the Chicago tournament. Lauren wanted to start a family and I was going to have shoulder surgery. We both knew this could be our last event together, so we really wanted to end on a high note. Well, we lost our first match and it just didn’t seem like we were going to get the finish we were hoping for. But we battled - winning seven consecutive matches to take the title! I’m so grateful we got the opportunity to push ourselves mentally, physically and emotionally one last time together and get that finish we wanted! “The other memorable moment was the 2018 Fort Lauderdale Major semifinals. Playing with Summer Ross against Barbara (Seixas) and Fernanda (Alves) from Brazil. The stadium was packed, it was blazing hot, and it was just one of those matches where each player left everything they had on the court. The rallies were fun and long and exhausting. The match lasted for 75 minutes and I think each set went to overtime. It really could have gone either way, but Brazil took the third 21-19. I would’ve loved to win but I was so proud to be playing in front of lots of my friends and family (who have supported me from the beginning) in a packed stadium on a beach where I first learned the game! Question - From this point on, what are your goals as a beach volleyball player? Brooke - “Taking it day-by-day, tournament-by-tournament but the goal is Tokyo 2020. Question - Once you finish playing beach volleyball, what will you do?